If you read my last couple of posts here at InspyRomance, you know that over the last month or two, we were beginning to look at selling our house and moving to “the city.” I’ve lived on a little farm for the past 7 years, and it’s been fantastic—wide open spaces, room for all the rescue animals I want, plenty of chickens, a giant garden, and even some adorable Nigerian dwarf goats. It’s been a dream kind of life on our little homestead. Except for the mosquitoes (our property borders a rice field…) and the long distance commute my husband makes daily (between 3-4 hours daily on the road makes for a long day and a tired husband). 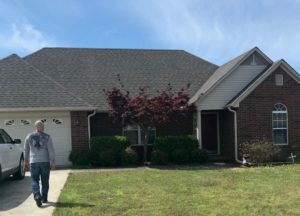 We initially looked for a place closer to his work on a few acres, but then my stepdaughter (age 12) officially decided to move in with us and start school wherever we chose to live. At that point, my plans changed! I want to be the “hang out” house and I know that means living in town. I’ll also be doing school drop off and pick up for the next few years, which meant proximity to school was a priority. Putting together the colors for the living area! Sage green will be the dominant color. And now the real struggle begins: packing like crazy and making plans for the new house. Our closing date will be in just a few short weeks and I’m currently surrounded by paint and floor swatches. I can’t help but notice what a wide variety of paint colors are on my “favorites” list. I really am all over the place when it comes to my preferences. 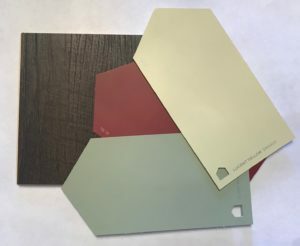 I have finally settled on the colors for all but one room, and they are all over the spectrum depending on what part of the house they are for. The side of the house where my office and daughter’s room will go are influenced by our love of all things beachy and nautical, while the living room and kitchen are warmer, richer colors. And the master bedroom and bathroom are more traditional and neutral. But somehow as I’m sitting here with those colors spread before me, they all seem to “go” together. The process reminds me of creating a character. When I first started writing, I think I was guilty of what I call “cookie-cutter” characters. There’s nothing really surprising about them. They fit a certain mold and don’t stray from that. The front of our new home! 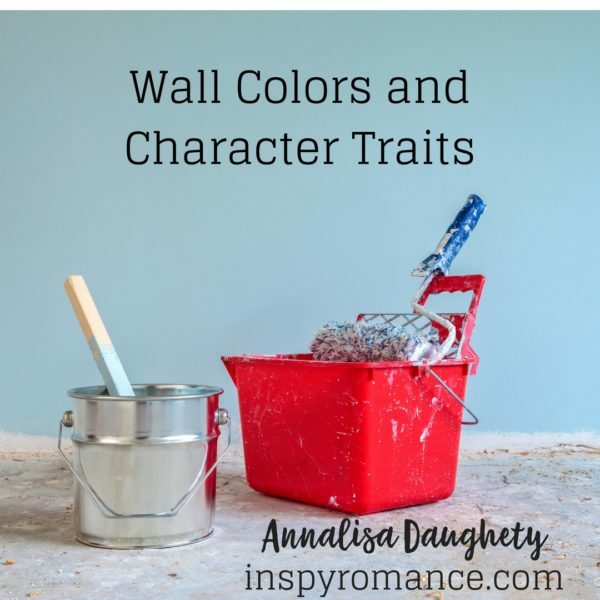 I think it helps to make the characters come to life even more—when they have an unexpected character trait, interest, or habit. I can think of several characters I’ve read who have stuck with me—largely because there was something “different” about them. They had traits I identified with or admired or that I just found interesting. How about you? Who is the last fictional character who has really stuck with you? And why? I’d love to hear your thoughts! Hi Annalisa! Congrats on your new home and wishing you a safe move. Since you are moving to the city, are your chickens and goats also moving to a new home? Nice color palette for your rooms. As an avid reader, usually the characters in the book or series I am reading sticks in my mind. I fell in love with the Baxter family in the Arcadia Valley romances, because as a teen I worked in a bakery. I had the privilege to ARC copies of the Tuscan Legacy series being released next week. I am in love with the Rossi family. Best wishes as you start a new chapter in your life. Thanks, Renate! I found a new home for my goats with a local family whose daughter adores animals. We can have a limited number of hens at our new home, and the rest will be moving to my dad’s farm, about a half hour away. I’ll be visiting his place a whole lot more, caring for my chickens and putting in a garden. I haven’t read the Tuscan Legacy series yet, but it is on my list! Looking forward to it! Hi Annalisa, best wishes for packing moving etc. it is certainly a busy time!! Usually the book I am currently reading sticks with me- I tend to read a variety of books, so lots of different characters. I think a character who is loyal, has some humour, and who is given time to grow/develop are those that stick the most. Congrats! Selling then buying and settling into a new home is a lot of work! Ethan from Finding Evergreen by Jennifer Rodewald has stuck with me since I’ve read the book. Congratulations on your new home. The characters from Where Hope Begins by Catherine West all made such an impact. Being the hang out house us a lot of fun. Enjoy your new house! I love beachy too. Our house is a mix. The great room and kitchen are farmhouse/rustic. My living room and master is pastel vintage. My office is beachy. Our son’s room is hunting. I’m glad I’m not the only eclectic one. Great observation on characters too. I love the actor who played Noah.